They say there's an exception to every rule. I recently learned that's true of my aversion to mascaras with rubber brushes. This exception comes in the form of Benefit They're Real mascara. I should have known I wouldn't hate this mascara. It's been recommended by many people whose opinions I value. But I wasn't willing to spend the money to try a new mascara I was sure I wouldn't like. Luckily for me, a sample of They're Real was part of my birthday gift from Sephora. (P.S. I'm assuming you're a Sephora Beauty Insider. If not, go sign up and get free things!) Now, I'm not going to tell you that They're Real is suddenly my favorite mascara, because it's not. But I will tell you that it's great. My lashes were nice and separated without looking thin. 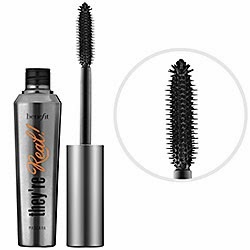 I don't have much of a concern with finding lengthening mascaras, so I typically favor mascaras that volumize my lashes. They're Real was able to do that, thus eliminating my number-one complaint about rubber-bristled wands. I don't know that I would pay the $23 price tag for this mascara. But if I ever saw this on sale, I would grab it up. Perhaps more importantly, this mascara has taught me not to immediately write off a mascara simply because I think I don't like its brush. 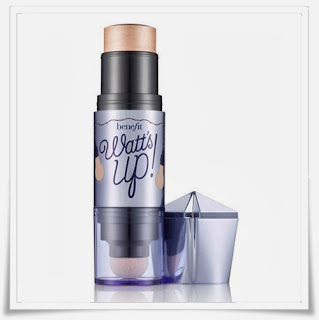 Also included in the birthday gift was Benefit's Watt's Up highlighter. I tried it. I didn't love it. I prefer powder highlighters, because (as this stick demonstrated) sticks can displace the makeup you're already wearing. If I were someone who didn't use liquid foundation, I'd probably like this more. I think I'll also try it again, next time applying it earlier in my makeup routine and using it with my foundation rather than after. All in all, Happy Birthday to me! Love hearing your perspective on these products! I'm a firm believer that this is no one perfect mascara out there for every woman because we all have different needs from our makeup. I love the highlighter product a lot. I heard you can use it to create an ombre look with your lipstick. I really want to try that. Hmm, cool. I just signed up to be an Insider. I want free stuff!